Through The Looking-Glass: Manny (Anthony Ramos) and Dennis (John David Washington) in Monsters and Men. 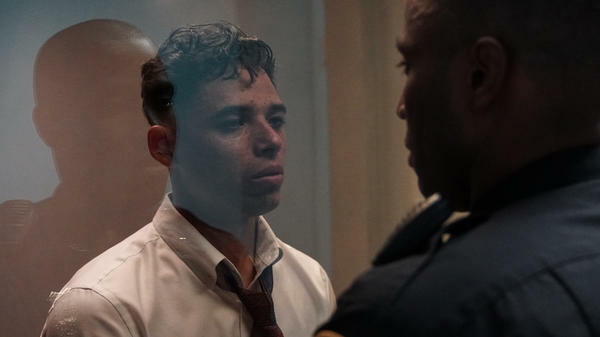 Green is clearly fascinated by vantage points, as he demonstrates with a prologue that introduces an African-American man, Dennis (John David Washington), as a face in his car's rear-view mirror. It's a face whose expression turns from blithe to anxious with the warning bleat of a police cruiser's siren. Monsters and Men was filmed exquisitely by Pat Scola, who follows the characters through Brooklyn and Manhattan with a handheld camera, conveying intimacy and distance simultaneously. The camerawork captures the feeling of being at home in the crowd, but with the nagging awareness that trouble could lurk around the next corner, and is as likely to come from cops as criminals. This is not simply the story of a black and Latino community oppressed by white police officers. Dennis, it turns out, is a cop. It's a job he's proud to have, even after Big D's death sparks protests and reprisals. In one of the movie's most emotionally complex scenes, Dennis defends the NYPD from the anger of a friend who's come to his house for dinner. Before circling back to Dennis, though, Green introduces Manny (Anthony Ramos), a buddy of Big D and a guy with a few hustles of his own. Manny is there when the neighborhood fixture is shot, and records the action on his mobile phone. Manny has reasons to be cautious: He shares a young daughter and a promising future with his pregnant girlfriend (Jasmine Cephas Jones, who like Ramos was in the original cast of Hamilton). Disseminating the video of Big D's killing is likely to threaten all that, since the footage appears to contradict the police's official story of what happened. But how can Manny suppress this evidence when the cops are falsely claiming they shot Big D in self-defense? Despite the cinematic visual style, Monsters and Men is stagey in places. It also includes a few clunky motifs, notably a recurring bit with paper airplanes. The thing that's most likely to divide audiences, though, is the movie's lack of a tidy resolution. The three stories are left hanging, as is the Internal Affairs investigation of Big D's death. Onscreen, at least, justice is not done, and the truth is not revealed. Even what the audience sees of Manny's video is inconclusive. But that's the point. Monsters and Men offers neither unalloyed despair nor implausible hope. It's about the way people of color live now, moving through the streets with passion, purpose and one eye on the rear-view mirror.